The Arizona Center in downtown Phoenix. 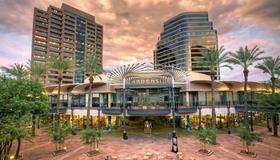 The Arizona Center in downtown Phoenix was sold for $136.5 million to Commonwealth REIT (NYSE:CWH) in Newton, Mass. The deal closed March 4. The sale likely is the largest real estate transaction in the state since the start of the Great Recession in 2008. CB Richard Ellis in Phoenix, Chicago and Los Angeles represented the seller, General Growth Properties. Commonwealth represented itself, according to Bob Young, senior vice president for CB Richard Ellis in Phoenix. “It’s a great property and these people, I think, will make it even better,” Young said. Located at the northeast corner of 3rd and Van Buren streets, the Arizona Center sits on 16 acres. It includes three parking structures, open space, retail shops and restaurants, a movie theater and two office towers. One 20-story tower is 100 percent leased by Arizona Public Service. The second 19-story tower is 88 percent leased to several tenants including the Snell & Wilmer law firm and Pinnacle West Capital. General Growth sold the Arizona Center as part of its Chapter 11 reorganization plan. “They are mostly a mall company and they were selling their non-core properties,” Young said. Commonwealth owns several properties in Phoenix, including the Anasazi Plaza I and II near Paradise Valley Mall, Regents Centre in Tempe and 8 South 84th Street, an industrial warehouse in Tolleson. Posted on March 9, 2011, in Commericial and tagged Arizona Center. Bookmark the permalink. Leave a comment.